Above: Gov. Kevin Stitt, Sen. Greg Treat and Rep. Charles McCall drove tractors to the state Capitol to kick off Ag Day at the Capitol. Above: OKFB Women’s Leadership Chair Mignon Bolay presented a gift card to Christie Puckett, the 2019 Oklahoma Ag in the Classroom Teacher of the Year. Above: Gov. Kevin Stitt stands with members of Oklahoma FFA and 4-H at Ag Day at the Capitol. Above: Gov. Kevin Stitt greets members of Oklahoma FFA and 4-H. Legislative Update: 2019 session winding down he temperature outside is rapidly warming up, and time left in the 2019 legislative session is just as rapidly winding down. With approximately six weeks at the state Capitol remaining, the difficult issues of reaching a budget agreement will be coming into focus soon. 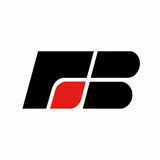 One primary area of concern for Oklahoma Farm Bureau this year has been rural healthcare. And a longrunning issue in Oklahoma has been the shortage of new medical doctors locating in small, rural communities. House Speaker Charles McCall and Sen. Roger Thompson are working to address this issue by advancing HB 2511. This proposal would create a five-year, partial income tax exemption for doctors who live and practice in counties with a population of less than 25,000. The fiscal impact of HB 2511 will be scrutinized just as closely as its policy ramifications. Speaker McCall has attempted this type of legislation in the past, but it has never made it across the finish line, due largely to the potential state revenue loss. A key piece of legislation for OKFB was signed in to law by Gov. Kevin Stitt on April 4. HB 2373 by Rep. Mark McBride and Sen. Julie Daniels establishes a limit on the maximum amount that may be awarded in noneconomic or “punitive” damages in an agricultural nuisance lawsuit. This was the first major ag-related legislation to be signed by Gov. Stitt. OKFB members visit with legislators, state agencies in Washington, D.C., during Congressional Action Tour ore than 50 Oklahoma Farm Bureau members traveled to Washington, D.C., to advocate for rural Oklahoma during the organization’s Congressional Action Tour April 1-5. Key topics of discussion for the week included the implementation of the new farm bill, immigration reform, the current farm economy, the importance of the relationship between the U.S. and Canada and the importance of international trade. “Not just in the United States, but in Oklahoma in particular, we raise more wheat, we raise more cattle, we raise more pork, we raise more cotton, we raise more of everything than we can possibly consume,” said Rep. Frank Lucas. “Therefore, it’s critically important that we have world markets to sell into to have a price.” In addition, Lucas emphasized the importance for the United States-MexicoCanada Agreement to be ratified as soon as possible by Congress so that trade negotiations with Europe and China can be finalized. OKFB members also visited with other members of the Oklahoma delegation inlcuding Rep. Markwayne Mullin, Rep. Kevin Hern and Rep. Kendra Horn. While in the nation’s capital, OKFB members attended both Senate and Congressional briefings, met with officials from the U.S. Environmental Protection Agency, U.S. Department of Agriculture, Canadian Embassy and the House Agriculture Committee. For more information on how you can attend a Congressional Action Tour, please contact Emmy Karns at 405-530-2681. Sen. James Lankford spent time talking with OKFB members about the issues facing Oklahoma farmers and ranchers. Sen. Jim Inhofe visited with members from Okmulgee County Farm Bureau. Elaine Flaming, Major County Farm Bureau member, visits with Douglas George, Acting Consul General of Canada, regarding the H2A program. While at AFBF, attendees were briefed on several federal issues facing farmers across the country. Bart Fischer, with the House Agriculture Committee Republicans, addressed members at the U.S. Capitol. More than 50 OKFB members traveled to our nationâ&#x20AC;&#x2122;s capitol to meet with legislators and government agencies to promote rural Oklahoma and agriculture. Pottawatomie County Farm Bureau members LeRoy and Karen Odell, along with other members, heard from Rep. Kendra Horn as she discussed the importance of agriculture within Oklahoma. Rep. Frank Lucas took time to speak with a group of OKFB Young Farmers & Ranchers and Collegiate members during the legislative reception. Above: Washita County Farm Bureau members Nocona and Jordan Cook visit with Oklahoma Farm Bureau field representatives while attending the OKC Farm Show, held April 4-6 at State Fair Park in Oklahoma City. Non-Profit U.S. Postage PAID Permit No. 131 Okla. City, OK.
Greer, Jackson, Kiowa and Washita Counties s the 2019 legislative session is coming to a close, Oklahoma Farm Bureau counties and districts across the state are hosting their annual legislative meetings. These meetings serve as an opportunity for legislators to hear from their constituents first-hand on how certain pieces of legislation â&#x20AC;&#x201C; including rural healthcare and ad valorem taxes â&#x20AC;&#x201C; can and will affect them. Top left: Washington County President Macy Strom addresses attendees at the Osage, Nowata and Washington legislative breakfast held April 5. Bottom left: Rep. Carl Newton spoke with members at the District 7 legislative dinner held March 28 in Alfalfa County. Top right: Members of Greer, Jackson, Kiowa and Washita County Farm Bureaus gather for their legislative dinner held March 28. Members had the chance to hear from Rep. Charles Ortega. 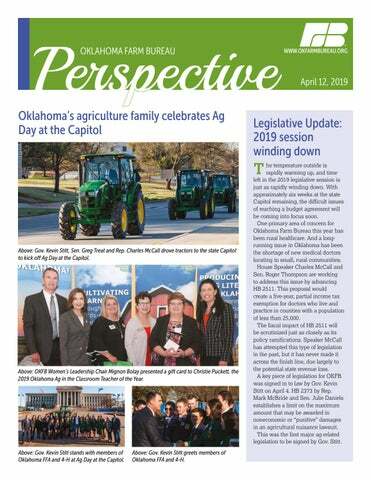 Perspective is the leading newsletter of Oklahoma Farm Bureau, the state's largest general farm organization.